The Berlin Blight Tour 2000! Sara: Here is another house. Look at Chris peering into one of the windows for evaluative purposes only. 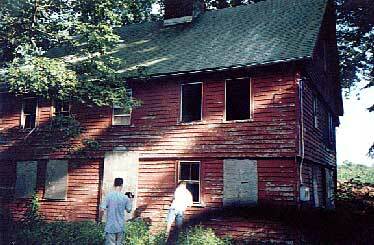 Chris: "Rustic Red," who does not lie within eyesight of any other house, had much to offer. Seeing the tall grass I await the onset of lyme disease - because I am an ignorant fop who has nothing better to do than wile away my time with paranoid indulgences and pragmatic concerns. Casey: This house is unbelievable. �Boy, are you in for a treat.